The Future is upon us! Meet Alexa. 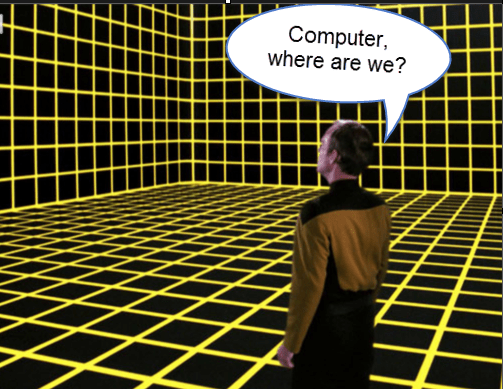 I remember watching Star Trek back in the 60’s and marveling at the ability of the Captain and crew to ask questions and get answers from a dis-embodied computer voice. We now are beginning to have that ability thanks to the advances in voice recognition, voice synthesis, and Internet connectivity. It’s not perfect, but it is evolving, and getting better all the time. 4/28/2010 – Siri was launched in the App Store. Sure, there were voice recognition programs before her, but this is the app that really started things for most people. You could ask a question or give a command and Siri would answer appropriately. On June 27, 2012, Google Now was unveiled as part of the premier demonstration of Android 4.1 (Jelly Bean) at Google’s I/O conference. More recently, in late March, 2014, Google started rolling out Google Now for Chrome users who are signed in to their Google account on computers. Microsoft’s entry is Cortana, named after a synthetic intelligence character in the Halo video game for the X-Box and available since 2015 on Windows Phones 8.1 and now Phone 10. It is also incorporated into Windows 10 on computers. These apps are all tied to another device, a phone or tablet or computer. Those devices have many other functions. We got ours in April before it was available to the general public. It was offered to Prime members first, and I knew I had to have one. It is about the size of a Pringles can and is designed to sit unobtrusively somewhere in a room and listen for it’s wake word, “Alexa.” With seven microphones, Alexa can hear you from across the room—even while music is playing. It is a really fine sounding speaker, comparable to $200 “dumb” Bluetooth speakers. Our favorite thing for Alexa to do is to play music – it sounds GREAT, and you can ask her for exactly what you want to hear. You can even ask her to turn the volume up or down, and to stop or continue. New capabilities are being added all the time. Already, there’s streaming music from iHeart Radio, Pandora and Amazon Prime Music. Listen to audiobooks from Audible. I love getting my up-to-the-minute news and weather “Flash Briefing” from a variety of sources, including local radio stations, NPR, and ESPN Sports from TuneIn. You can connect your Google Calendar and get schedule updates. Are you a commuter? Get traffic reports before heading out to work. I haven’t tried it yet, but you can control lights and all manner of connected devices around the house with WeMo, Philips Hue, SmartThings, Wink, and more. You can even re-order stuff from Amazon.com, hands-free, go figure! Alexa lives both locally and in “the cloud,” so she is always learning. The more you use it, the more she adapts to your speech patterns, vocabulary, and personal preferences. Software updates are even delivered automatically. You set it up with the free companion app for Android, iOS, Amazon Fire, and desktop browsers. You can remotely manage your alarms, music, shopping lists, and more. I really like the shopping list feature. 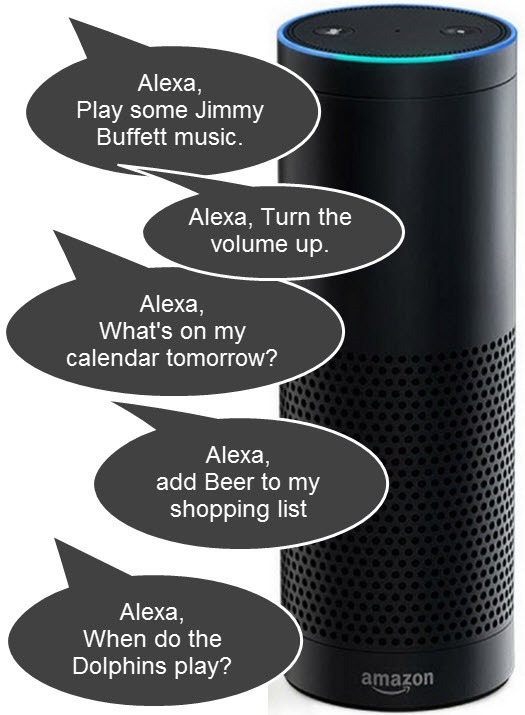 Just tell Alexa to add something to the list, and it is on the app when I am in the store shopping. If you have an Echo, let us know. p.s. Don’t believe the hype that it’s a sinister, potentially alien artificial intelligence that’s bound to kill us all. Published by MrGeek, in Blog. Tagged with #GeeksWhoTeach, Amazon, Amazon Echo, Android, Apps for Travelers, Ask Alexa, Droid, Intelligent Personal Assistants, iPad, iPhone, Smartphones, Technology for Travelers. I have two Amazon Echos and love them, I got my first one early this year. I know it is a 1st generation products and but they are doing a good job taking feedback from customers and adding features that we asked for. Also thanks for mentioning the Amazon Echo Fan community called How do I use my Amazon Echo in your article. My goal is to keep growing the community as the leading discussion on how to use the Amazon Echo. You all have a great show!! I’ve had the Echo since 2 weeks after its release of Nov. 6, 2014. I know the exact release date because I asked “Alexa, how old are you?” Best geek purchase I’ve ever made!! She arrived on my birthday Nov 20th so I imagine I’m one of the first purchasers.